4 - Lori Campbell — Our Ink, Our Stories. In Roman Orthography Cree-Ojibway, Lori Campbell’s traditional name is Anang Makwa which translates to Star Bear in English. The name is tattooed on her upper arm in Cree Syllabic, surrounded by blue stars that form the Big Dipper and a bear with piercing blue eyes. The tattoo is a tribal design in black ink, with the exception of the two blue features. She designed the tattoo herself, carrying it around for years and making minor tweaks, waiting to find the right artist. While visiting Montreal eight years ago, she found the artist she was looking for. She doesn't remember the shop or the artists’ name, but she remembers the connection they had, which she says was most important. “Just that moment, everything was good . . . it just gelled,” she said. The bear is not what you’d expect; its features are almost dog-like. The eyes, Lori said, are an homage to her own dog’s ice-blue eyes. Bears are usually portrayed as grizzly and aggressive, but Campbell’s design shows the animal’s softer side, strong and content. 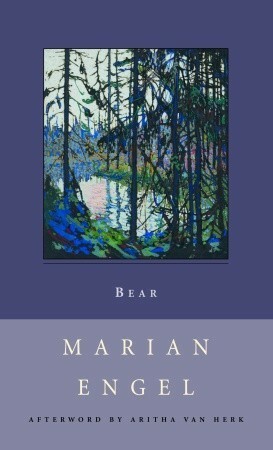 If you can get past the somewhat bizarre but metaphorical relationship between a woman and bear, this novel, winner of Canada's Governor General's award, is really a compelling tale of a woman finding that she has the strength to take control of her destiny.